Part of the show comprises much puffing of chest and spreading of tail feathers. 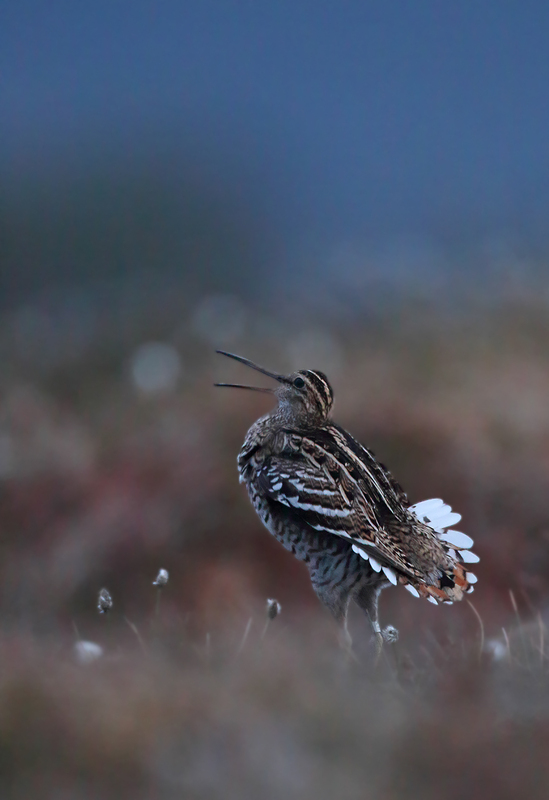 Almost a month ago I was lucky enough to spend a few nights watching and photographing the great snipes (gallinago media) on their lek (playground, for want of a better word) in Jämtland, Sweden. They’re a feisty lot, allegedly flying from their wintering quarters in West Africa to their Scandinavian breeding grounds in one non-stop megaflight, then spending more than a month vying for the attention of the coveted ladies by going all-out on the lek all night, and hopefully catching a little shut-eye plus some nourishment during the days. Since the show takes place at night, and we aren’t quite far enough North to meet the midnight sun, photographing the critters is a challenge – for the camera as well as for the photographer. The first night saw rather adverse weather too, with temperatures dropping to around +1 degrees, a wind reaching 20m/s and quite some precipitation. This only bothered the photographers and their equipment; the birds kept at it like nothing could stop them. Fortunately the high-end Canon gear is well-sealed against precisely this sort of thing, the photographer often less so. The birds arrive at the lek almost completely unnoticed around 9PM, but soon they’re all around, and too busy strutting their stuff to care about neither bird watchers nor -photographers. Our particular lek had upwards of 40 birds in action during the night, and is said to be one of the most popular among the snipes. These mill around between the tussocks, and interrupt their busy schedule only to fight other males, or get up onto higher tussocks to perform a peculiar little song/dance. The noise they make come from their beating the mandibles of their beaks together, and each and every little display is identical to the next one – how the ladies do their selection is a total mystery to me, but then I am only human and can hardly be expected to understand the intricacies of snipe courtship. And speaking of ladies; we never saw a bird which we could positively say was a female, but they must be around to check out the goods, or the whole scene makes even less sense. As the whole thing takes place during the darkest hours of the short summer night, I have deliberately sought to purvey the feel of the scene by keeping the images relatively dark – if left to its own devices the camera will always try to expose each frame “correctly”, i.e. with long enough shutter times, and large enough aperture openings, to show the image as if it had been day-lit. This makes for a somewhat gloomy gallery this time around, hopefully it will manage to give you an impression of this great natural spectacle. As usual, please click on the first image to open up the gallery, and remember that once you’re viewing the individual images it is possible to click on them to see them in their full glory – this makes for the best/sharpest viewing experience. There’s a separate gallery beneath the snipes for other images from the trip. The images show different stages of the actual display, which lasts something like 5-10 seconds each time. I don’t have a decent complete sequence from start till end, so you’ll have to use your imagination. The challenge is to get the shot of the bird when it is relatively clear of the surrounding vegetation. Check how much he can turn his hind quarters. I suppose he uses that in flight too, but it can literally be twisted 90 degrees! He’s like a little bodybuilder. Since there’s no light the rapid bill movements lead to a completely blurred bill – but this gives a good feel for the sound of the summer night up there. No displaying without flapping one’s wings. Rock ptarmigan (lagopus muta) outside of its normal perceived comfort zone. Teal (anas crecca) in an unusual reflection. It is a yellow “Åkerman” digger being used to dredge the inlet where these birds like to hang out. While waiting for the great snipes to begin their lekking display, the sunset on the surrounding landscape makes the waiting so much more interesting. “Light in the dark” – a small hole in a cloud, and a long telephoto lens trained on the cloudy mountain side. The lenticular clouds are formed by a strong wind blowing a stable airmass over a tall obstacle (like a mountain chain). To paragliders they are a good indicator that the winds are now beyond safe, but to photographers they’re just a great subject. These ones, with tails, are unlike any I have seen before. More lenticular clouds – these are more standard-looking. Reindeer calf from last year. The reindeer aren’t technically “wild” since they belong to someone – but it’d be a stretch to call them “domesticated” too. Rock ptarmigan in its ‘hood – the famous Villmarksvägen, on the border between Lappland and Jämtland. Early morning (like, 0330AM) shot.